RCSWin's calculation engine generates all design calculations per ASME Section VIII Division I and TEMA. 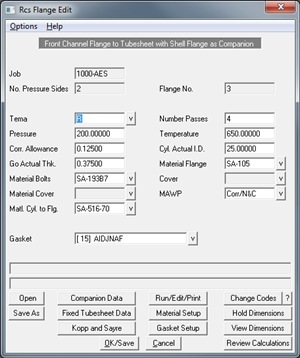 In addition to calculating all exchanger components individually, the software calculates overall dimensions, bundle setup, supports, exchanger weights, volumes, center of gravity, bill of material data, and drawing data. A similar nozzle input screen allows the user to enter all of their nozzles in one location. The fast input option intelligently selects nozzle types and locations based on the exchanger type, or the user can manually specify all aspects of the nozzle design including orientation, configuration, type, couplings, location, angles, offsets, reducer pipes, etc. Users can run the RCS Menu mode to modify and tailor a design to their specific needs. 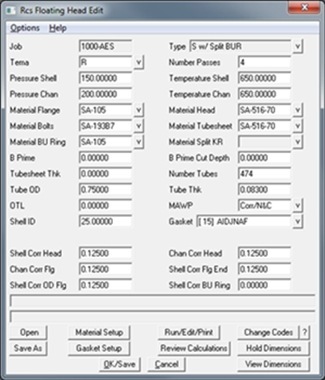 Using a series of graphical screens and "change codes", the user can specify "hold" dimensions, set specific variables, customize materials, set specific gasket, flange, nozzle, etc. types, and customize their design in most any way. This is excellent for unique and complicated designs, or for duplicating an existing design. 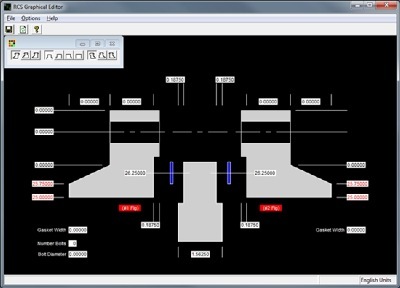 In addition to the standard input screens, there is a graphical interface for specifying dimensions on flanges and floating heads.